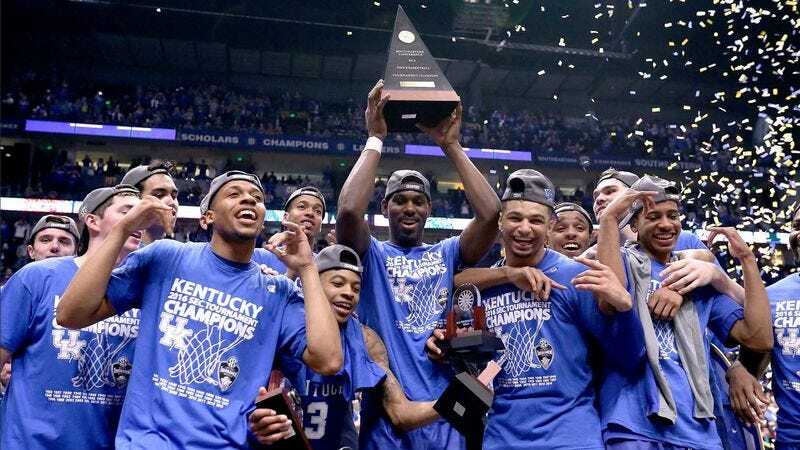 LEXINGTON, KY—In an appalling revelation that has sent shockwaves through the program, multiple reports confirmed Thursday that seniors on this year’s University of Kentucky basketball team were repeatedly subjected to cruel and degrading forms of hazing by the team’s freshman players. “We discovered a number of incidents in which Kentucky’s upperclassmen were forced to carry the squad’s gym bags to and from practice, sit in a locked closet for hours at a time, and consume excessive amounts of alcohol until the point of vomiting,” said NCAA investigator Derek Jones, adding that the humiliating and barbaric rituals were strictly enforced by the team’s first-year players. “This was apparently seen as a way to make the seniors understand their place on the team, but regardless of the reasoning, it is absolutely unacceptable. Several players said they were often frightened for their safety, but felt they had to continue or they would be punished even further by their freshman teammates. Unfortunately, this is a growing trend among top college basketball programs, and it has to be stopped.” Following the report, the University of Kentucky athletic department announced the immediate suspension of all accused players amid an internal investigation, leaving Wildcats coach John Calipari no choice but to field a starting lineup with no freshmen in the NCAA Tournament.